It’s 10 p.m. — do you know where your favorite Sox, Cub has shifted? You can tell the players without a scorecard under Joe Maddon, but you better keep a sharp eye where they’ve shifted defensively in the field. An accompanying Chicago Baseball Museum story details the historic defensive brilliance of Albert Almora, Jr. in center field. But at any time, Almora, Jr. could be flanked in the outfield by former MVP Kris Bryant, a pretty good defensive third baseman. Or by energetic starting catcher Willson Contreras, taking a break from behind the plate. Bryant has played every position on the field except second and catcher. Bill Melton’s mood had improved considerably by the time this photo was taken, compared to the days he broke his nose playing third base and got shifted to right field. Under Maddon, Ben Zobrist plays anywhere, and will continue to do so as long as he’s a Cub. Javy Baez is a wizard at second base, but you’ll also see him at shortstop and maybe even third. About the only Cub who is safe at his natural position is first baseman Anthony Rizzo. But he had batted leadoff, and if Maddon got some kind of brainstorm to play Rizzo in, say, left field, the affable team leader would be game. Notice that none of these players are Hall of Famers, yet, or has led the NL in homers. Apparently, being able to take your glove anywhere, under duress or via an ill-advised management decision, toughens you up. That’s what Chicago baseball historical (sometimes hysterical) annals show. Some of the top achievers in the town’s history have played well out of position, and if you remind present-day fans who haven’t done a forensic research of the game, they won’t believe you when informed of their on-field wanderings. Ernie Banks in left field and third base. 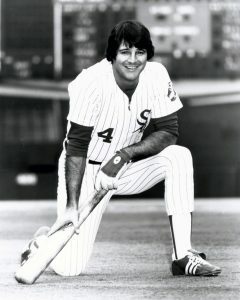 Ron Santo at shortstop, second and left field. Billy Williams at first base. Bill Melton in right field. Carlton Fisk in left. And Kenny Williams, GM of the only Sox team to win the World Series since 1917, survived a trial by fire playing Melton’s old natural position at third after being a good center fielder.